Centenary Irish Poppy pin to honour and commemorate the memory of the Irish men and women from across the Island of Ireland who gave their lives in service in the Great War. Earlier this year, I concluded an article about Barwon Rowing Club’s 1914 maiden eight with these words: ‘By remembering one man, we remember them all’. On this Remembrance Day, I would like to do just that. 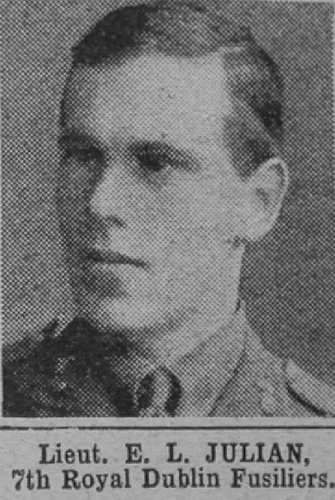 The man in question, Lieutenant Ernest Julian, died just over a centenary ago in the ill-fated Gallipoli Campaign and his story has briefly been told before on this site in an article about Penn’s Visit to Ireland in July 1901. Since it was published in June 2011, I have collected more information on Lieut. Julian and the memorials on which he is mentioned. Born on 28 July 1879, he was the son of the late John and Margaret Julian, of Drumbane, Birr, King’s County (now County Offaly), Ireland, and was educated at Charterhouse, England (finished 1897), and Trinity College, Dublin, where he was a Senior Moderator in Classics, and awarded the Brooks Prize. It was at Trinity that Julian learned to row and was in their senior eight in 1900 that reached the final of the Thames Cup at Henley only to lose to Trinity College, Cambridge, by a third of a length after leading for three-quarters of a mile. Julian was elected captain of Dublin University Boat Club (Trinity College, Dublin) in 1901. The club entered both the Thames Cup and Ladies’ Plate events at that year’s Henley but scratched from the Thames and lost to Eton College in the Ladies’. Shortly after Henley, the University of Pennsylvania travelled to Ireland to race Trinity College. The following photograph was taken in front of The Lake Hotel, Killarney, County Kerry. Julian is seated in the middle row, wearing the cap. The 1901 Varsity crew of the University of Pennsylvania intermingled with the crew of the Dublin University Boat Club. Back row: (L to R) Fuller L. Davenport age 23, sophomore in dental school (3 seat), Andrew Jacob Kuhnmuench age 21, senior in dental school (substitute), Gordon (also seen as Gurdon and Guerdon) Spicer Allyn age 21, sophomore in medical school (6 seat), William Gilfillan Gardiner age 20, sophomore undergraduate, varsity football (7 seat), Arthur Conrad Jackson age 21, senior undergraduate (substitute), Robert Howard Eisenbrey age 18, sophomore undergraduate (2 seat). Seated: (L to R) Ralph Russell Zane age 19, freshman undergraduate, (bow seat), Arthur Heath Flickwir age 22, ’01 graduate school of medicine (5 seat and captain), John Paterson Gardiner age 22, ’01 graduate school of medicine, varsity football and gymnast (stroke). Front on ground: (L to R) Samuel Crowther, Jr. age 20, ’01 college graduate, football (4 seat), Luther J. Smith age 22, ’01 graduate of dental school (coxswain). Apart from Julian, the only other Dubliner identified is the cox, H.L. 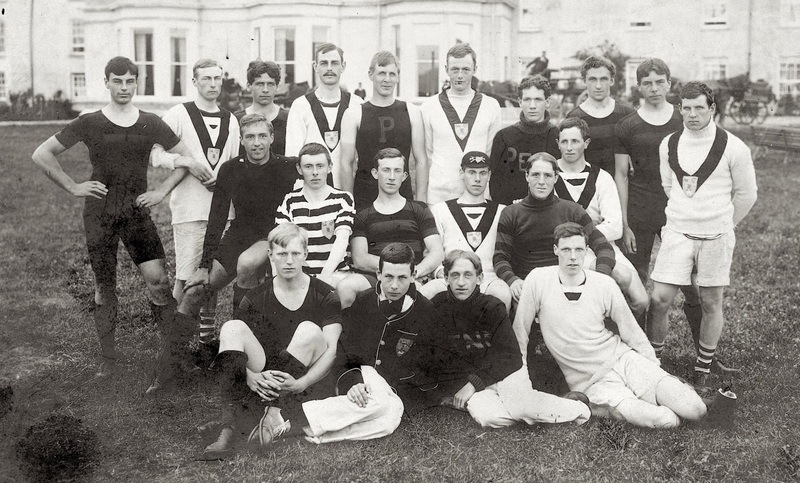 Murphy (front row wearing the blazer). According to Raymond Blake, in his 1991 book, In Black and White: A History of Rowing at Trinity College, Dublin, Julian was foremost amongst those responsible for the change at the club that saw professional trainers replaced with old members of the boat club and gentlemen coaches such as R.C. ‘Rudie’ Lehmann. Blake writes: ‘Among them was Ernest Lawrence Julian, as devoted and loyal an ex-member as could ever be wished for.’ Julian and Lehmann combined to coach the club’s 1903 senior eight to victory in the Thames Cup at Henley, beating Kingston RC in the final by one length. 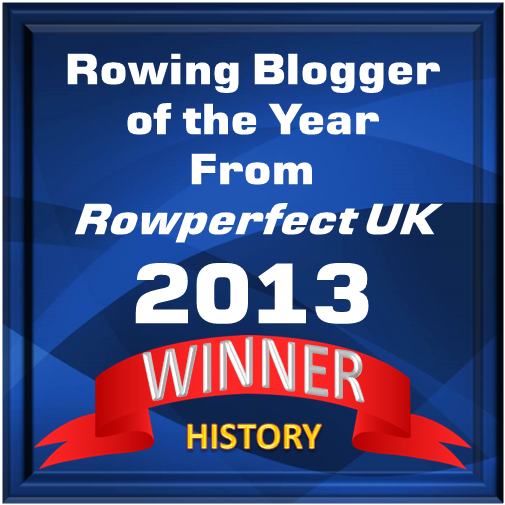 It was Trinity’s first win at the Royal Regatta since 1881; they had to wait until 1977 for another. 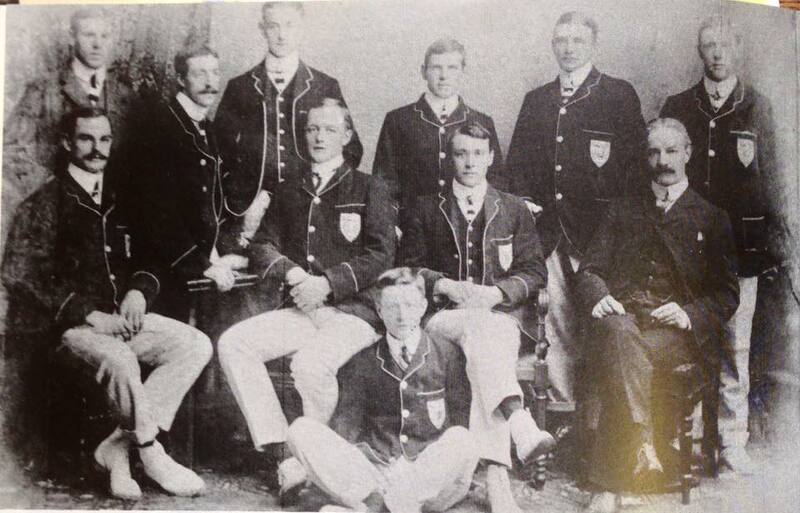 The 1903 TCD senior eight, winners of the Thames Cup at Henley Royal Regatta. Back row: (L to R) E.L. Julian (coach), H.B. Mayne (6), W.F. Fox (bow), J. Cunningham (2), M.P. Leahy (3), J. du P. Langrishe (7). Front row: A.A. McNeight (4), H.A. Emerson (5), E.B. Bate (cox, in front), F.J. Usher (stk. ), R.C. Lehmann (coach). This is an unusual book in that it is the record of a company, a company of the 7th Royal Dublin Fusiliers (RDF) – ‘D’ Company – at Gallipoli. The battalion was raised in August 1914 and allocated to 30th Brigade, 10th Irish Division. At the request of a Mr Browning, President of the Irish Rugby Football Union, the CO of the new battalion agreed to keep open a special company, ‘D’ Company as it was subsequently known, for “Pals” from the Irish Rugby Union volunteers. It was a remarkable mix of volunteers – barristers, doctors, solicitors, stockbrokers, bankers, civil servants and the like, nearly all well known in Dublin’s public and social life. Training in Ireland went on until, on the last day of April 1915, 7th RDF sailed for Holyhead and from there travelled to Basingstoke, the concentration area of the 10th Division. The final period training at divisional level lasted to the end of June and a week later they were off to the Dardanelles. They landed at Suvla Bay on the morning of 7th August and there follows a comprehensive account of the fighting over the next few weeks, especially as it affected “D” Company. The first major battle was the attack on Chocolate Hill and then there was protracted fighting on Kizlar Dagh Ridge. Lieut. Ernest Lawrence Julian in his Royal Dublin Fusiliers uniform. 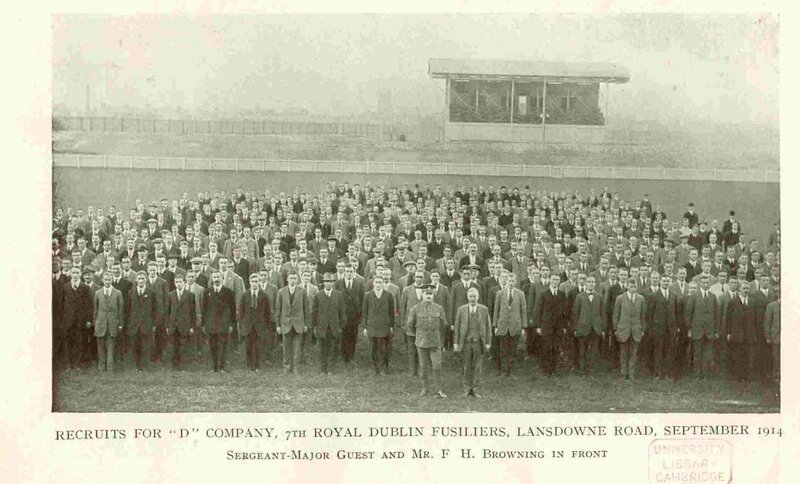 In August 1914, Professor Julian marched to Lansdowne Road and enlisted in ‘D’ Company of the 7th battalion, Royal Dublin Fusiliers. Before the declaration of war, there were two battalions of Royal Dublin Fusiliers in the Regular Army. The 2nd battalion was nicknamed ‘The Old Toughs’ after their campaign in the Boer War. Unsurprisingly, the wags in Dublin, in all good humour, christened ‘The Dublin Pals’ the ‘Toffs among the toughs’. When the recruits arrived at the Curragh to start their training, they were allowed to elect two of their number as their officers. Julian was one of those elected and went on to become one of the first soldiers of the 10th Irish Division to be killed in action when he died of wounds after leading his men during the assault on Chocolate Hill, Sulva Bay, Gallipoli, on 7 August 1915. It was his first day of action in the face of enemy fire. He was shot in the back and died the following day, age 36, on the Hospital Ship Valdivia and was buried at sea. 239 men sailed for Gallipoli with ‘D’ Company. By the time they set sail for Lemnos, Greece, just seven weeks later, the company had been decimated and its strength had been reduced to just 79 men. Of the spirit-world to tread! A photograph of the Dublin Pals at the home of the Irish Rugby Football Union before they set off for training at the Curragh. Where’s Ernest? Photo: University Library, Cambridge. Ernest Julian is named on a number of memorials. 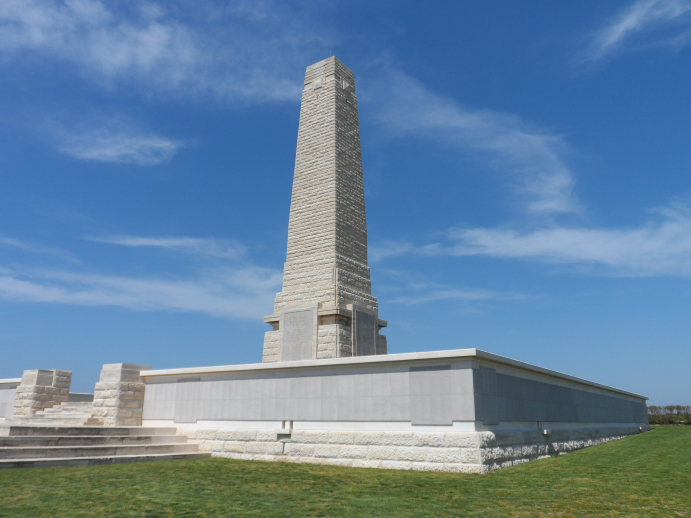 Perhaps the most impressive is the 30 metre high obelisk known as the ‘Helles Memorial’ near Sedd el Bahr, Turkey. The Helles Memorial. Photo: Commonwealth War Graves Commission. The memorial serves the dual function of being a Commonwealth battle memorial for the whole Gallipoli Campaign and place of commemoration for the 20,885 Commonwealth servicemen who died there and have no known grave and includes panels for those who died or were buried at sea in Gallipolian waters. 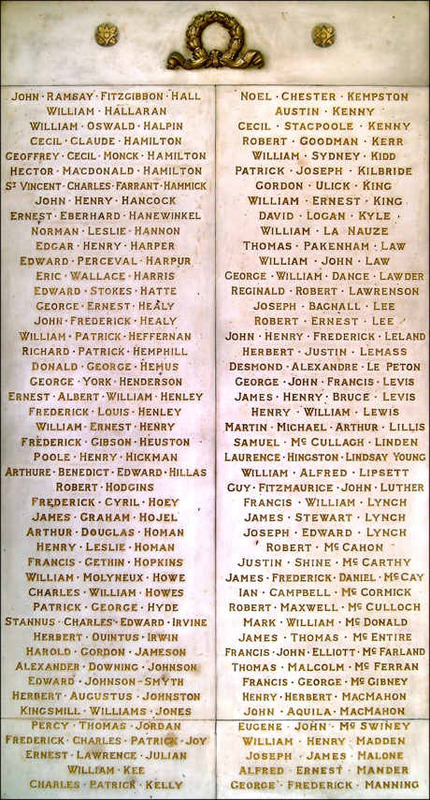 Ernest Lawrence Julian named on one of the panels at the First World War ‘Hall of Honour’, Trinity College, Dublin. 3,529 Trinity students, staff and alumni fought, and 471 died, in military service during the Great War. 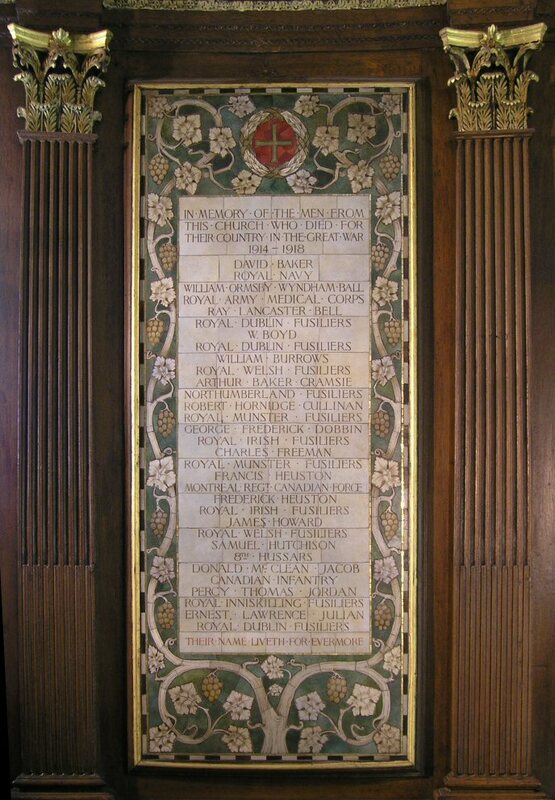 Those who died are remembered in Trinity’s Hall of Honour which acts as the entrance of the 1937 Reading Room. The Hall of Honour was officially opened in 1928 by the Vice-Chancellor Lord Glenavy in the presence of Provost E.J. Gwynn and invited guests. A two-minute silent black and white film of the event, by British Pathé, may be seen here. Barristers’ Memorial, Four Courts, Inns Quay, Dublin. The ‘Four Courts’ is Ireland’s main courts building and houses both the Solicitors’ and the Barristers’ Memorials to those killed in the 1914-1918 conflict. Julian’s name is on the latter alongside that of Irish Nationalist leader, William Redmond. 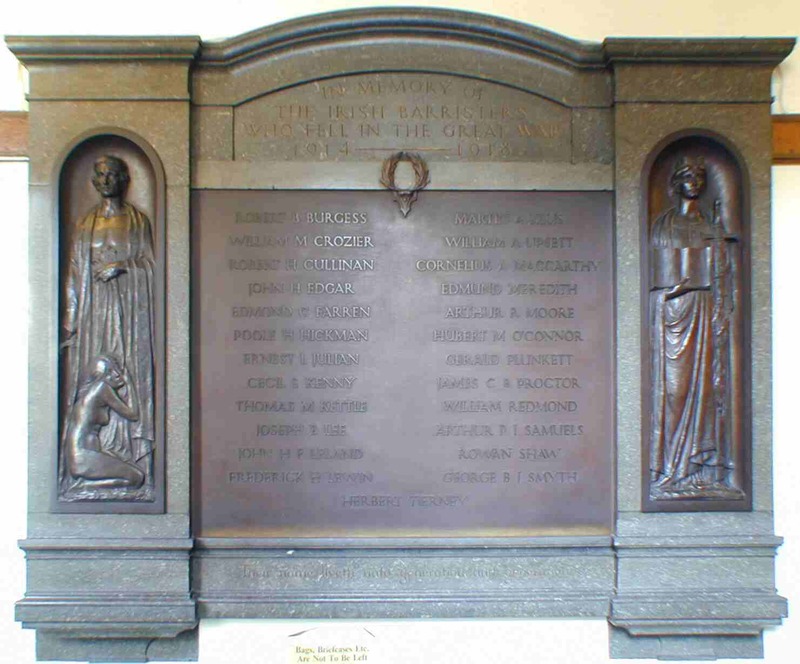 Great War Memorial, St. Ann’s Church, Dawson Street, Dublin. Julian is remembered on two memorials in St. Ann’s Church, Dawson Street, Dublin: on the Great War Memorial (above) and in a stain glassed window dedicated to him and his fellow barrister Robert Cullinan (also named on the Four Courts memorial). 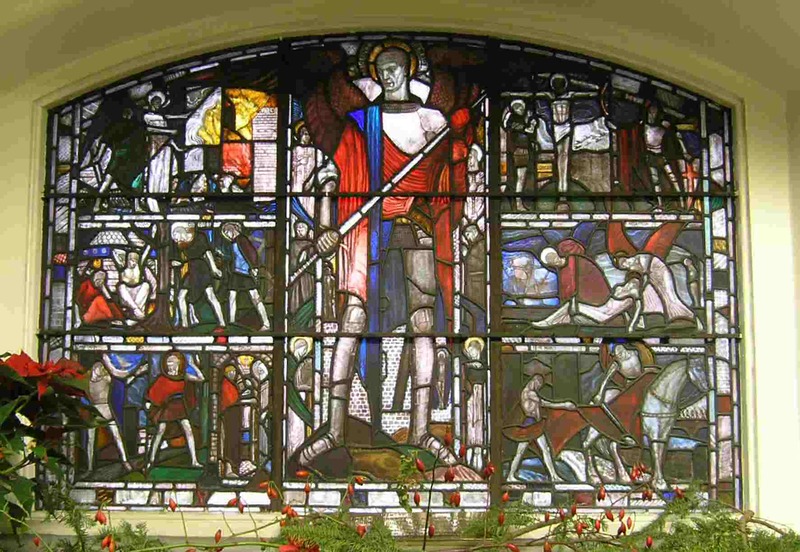 Stained glass window of St. Michael trampling down a dragon, representing the struggle between good and evil, by Wilhelmina Geddes, 1918. Below, a brass plate with inscription. At 11 a.m. on 11 November 1918, the guns finally fell silent. Julian and his friends in the ‘Pals’ may have died ‘not for self, but for fatherland’ in ‘the war that was to end all wars’. Sadly, that wasn’t the case. As George Santayana wrote in 1922: ‘Only the dead have seen the end of war’.